We blog writers walk a line (though some that I have read don't seem the least big conscious of crossing it) that divides the blogging world into hemispheres. On one side is the realm of autobiographical sharing in a way that offers readers exceptional insight into life, in general (as do the bloggers zmkc and Steerforth). The other side is the incessant prattling of those who think everyone cares what they had for lunch. I try to be careful. My posts are not always autobiographical, because, if I wish my life were more interesting (which I do), then why would others want to always hear about its most superficial details? Yesterday, though, I was talking to a co-worker. I mentioned to her that my band had to play tonight (Wednesday, Nov 26) and she mentioned how interesting it would be to tag along and see what goes into being in a working band -- the implication being, I think, a not-famous band; a band in the trenches of "gigging." So, why not? Maybe some others will find it interesting. At the very least, this is an aspect of my life that is "out of the ordinary" and this might be cool for my sons to read when I am, as my father-in-law says, "toes-up." Today, since the club is close to my home, I'll finish work at my school after a half-day schedule and I'll head to a bar -- a pretty large room -- to set up my drum kit. This will happen at about 1:00, PM. In the U.S., the night before Thanksgiving is the biggest bar night of the year; people have off of work the next day; students are home from college. Setting up any time after dinner is really not an option, especially for the drummer, because the place will be too full or revelers for me to walk through with the gear. Tony, one of our guitarists, who doubles as the band's "sound guy," will have already been there to set up our extensive sound system and he will have left all of the cords necessary for us all to "plug-in," including me; I need to set up the drum microphones and my vocal microphone and monitoring system. I'll either find that the stage is empty or that the other guys have come with their stuff. If the stage is empty, I'll need to place the drums in a way that allows everyone else to fit -- Kurt, on bass; Jeff, on vocals and guitar; Jimmy on guitar and Jeff ("Jazzy") on keyboards. already packed from the last job a few nights ago. No matter where I set up, I will get complaints when the band arrives. ("F-ing drummers...") They will proceed to set their stuff up so close to my drums that I will be nearly unable to go in and out. I will consider bringing a TV and a pillow and just staying back there between sets. Set up takes me around an hour, if I take my time, the way I prefer. (There is nothing worse than starting the first song and realizing that rushing to set up has resulted in cymbal being too far away of a stand not tightened enough to avoid collapse...) I'll go home after set-up, but, first, I will take down all of the cymbals I have set up (for positioning) because they tend to "disappear" if you leave them -- I will do the same with the microphones, for the same reason. After set-up I will admire the aesthetics of the drums. 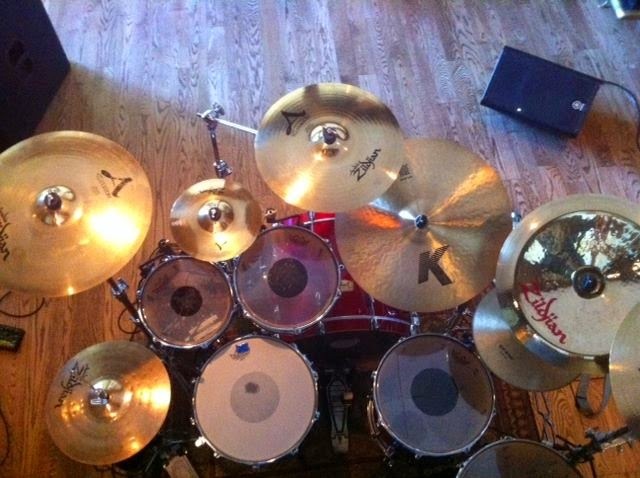 (For some reason, I am in love with the way a drum set looks.) Then I will drive home. I will spend time with my family, have dinner, relax a bit, shower, etc. (Sometimes I try to get in a nap, because we normally play until 1:30 and don't get home until two or three.) A half hour before I leave, I will go up to my studio and warm up on my practice set because my old bones and muscles need it. Then, it will be out the door -- always reluctantly as I look at my boys and my wife and my dog in the cozy house, under blankets and behind books or watching TV. It is hard to leave, but when I sit down behind the drums, it always feels like I've made the right decision. That's the pre-gig... On Friday, I will cover the job itself. programming the lights in the background. on one end and into the sound mixing board on the other. Everything is up but the cymbals and microphones.